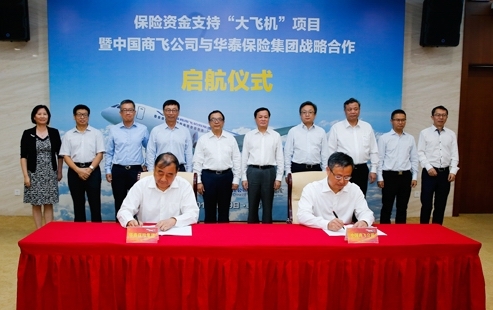 COMAC signs Strategic Cooperation Agreement with Huatai Insurance Group__Commercial Aircraft Corporation of China, Ltd.
Commercial Aircraft Corporation of China, Ltd. (COMAC) signed a Strategic Cooperation Agreement with Huatai Insurance Group Co., Ltd. (Huatai Insurance Group) on August 9th, 2017. Mr. Chen Wenhui, Vice Chairman of China Insurance Regulatory Commission (CIRC), Mr. He Dongfeng, Chairman and Secretary of the Party Committee of COMAC, and Mr. Wang Zimu, Chairman and CEO of Huatai Insurance Group, attended the signing ceremony. With the strong support of CIRC, Huatai Asset Management Co., Ltd. established an insurance debt investment plan to provide a fund with a total amount of 15 billion and a term of more than 10 years for COMAC to support the research, development and production of China's trunk liner. This debt investment plan signed between Huatai Asset and COMAC is not only one of the biggest debt investment plans registered at the Insurance Asset Management Association of China (IAMAC), but also a pioneer of cooperation between insurance fund and COMAC. The cooperation with COMAC is an important step for Huatai Insurance Group to actively respond to the national development strategy and support the development of COMAC, and reflects multiple advantages of insurance fund to support the real economy in response to the national call. With regard to the capital, in addition to the investment of Huatai Insurance Group, other companies in the insurance industry will be introduced to jointly support the development of the real economy. With regard to the term, the project investment is preliminarily made for 10 years, and COMAC may propose whether to extend the project investment according to the actual need of its production and business operation after expiration, which fully reflects the characteristics of insurance fund that has long term and large scale, and therefore can better serve the real economy. With regard to the safety, the trunk liner program is not only of far-reaching strategic significance at the national level, but also promoted by the whole nation. At present, the trunk liner has secured a large number of orders from domestic and foreign airlines, the future business development space is huge, the batch production capacity will be highlighted, the profitability will be improved substantially, and the safety is self-evident, and therefore safe and stable investment return of insurance fund can be ensured. COMAC will meet the needs of its initial investment and realize the win-win situation of finance and industry through this debt investment plan. Based on the good start, Huatai Insurance Group and COMAC have further reached a strategic cooperation agreement. To thoroughly apply and implement the important indications of General Secretary Xi Jinping on "providing services for the real economy by financial industry", Huatai Insurance Group will provide a wide range of quality services for COMAC in insurance business as well as debt and equity investment and financing in the future. Commercial Aircraft Corporation of China, Ltd. (COMAC) functions as the main vehicle in implementing large passenger aircraft programs in China. It is also mandated with the overall planning of developing trunk liner and regional jet programs and realizing the industrialization of civil aircraft in China. COMAC is engaged in the research, manufacture and flight tests of civil aircraft and related products, as well as marketing, servicing, leasing and operations of civil aircraft. COMAC is formed on May 11th, 2008 with the approval of the State Council, and jointly invested by State-Owned Assets Supervision and Administration Commission (SASAC) of the State Council, Shanghai Guo Sheng (Group) Co., Ltd., Aviation Industry Corporation of China (AVIC), Aluminum Corporation of China Limited (CHALCO), China Baowu Steel Group Corporation Limited, and Sinochem Corporation, and headquartered in Shanghai. Huatai Insurance Group Co., Ltd. (Huatai Insurance Group) is a comprehensive financial insurance group that integrates property insurance, life insurance and asset management, with the predecessor as Huatai Property & Casualty Insurance Co., Ltd. established in 1996. Over the past 20 years since its establishment, Huatai Insurance Group has always been on the mission to "make people's quality of life not changed by risks", and has been committed to "take the customer as the center and build the company into an excellent financial insurance group which provides high-quality and professional risk security and wealth management". Huatai Insurance Group has been deeply committed to the insurance industry for a long term, constantly adhered to the nature of insurance industry (i.e. to provide insurance) in accepting insurance and applying fund, and actively guided insurance fund to provide services for the real economy. Its wholly-owned or controlling subsidiaries, including Huatai Property & Casualty Insurance Co., Ltd., Huatai Life Insurance Co., Ltd. and Huatai Asset Management Co., Ltd., were all established relying mainly on their own profits obtained from investment and developed into excellent companies with strong influence in the industry. Huatai Insurance Group established another subsidiary, Huatai Baoxing Fund Management Co., Ltd., in the field of publicly-offered funds in 2016. Before the signing ceremony, Mr. Chen Wenhui and his delegation visited COMAC Manufacturing and Final Assembly Center and Flight Test Center, and learned about the research and development progress of C919 program on site.